It's basically Google Trends, but for products/ecomm. I have yet to dive in fully, but seems to have immediate value for various things. I figured I'd post some more info about this while I'm looking at it so you guys don't have to click through if you don't want. In a recent study, we learned that 84 percent of Americans are shopping in any given 48-hour period, in up to six different categories. This new Shopping Insights tool has data for more than 55k products and 45k brands. It's free. Nearly nine out of 10 smartphone users are not absolutely certain of the brand they want to buy when they begin looking for information online. 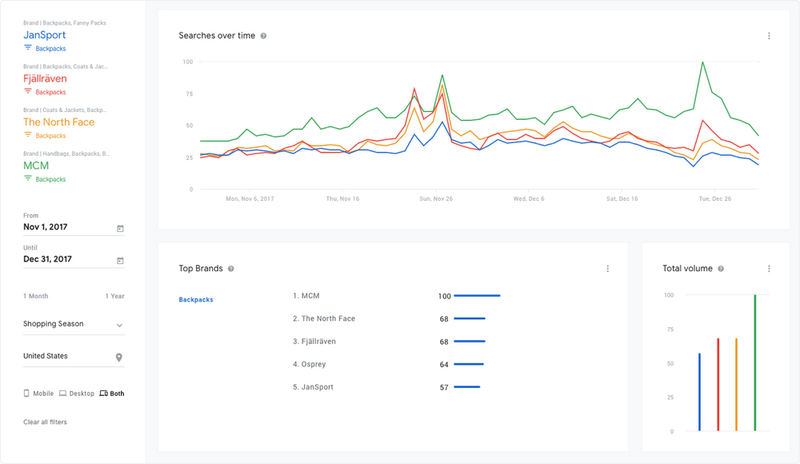 You can look for seasonality, do brand comparisons, find out which brands show up in what percentage of queries and tailor your Shopping Ads to include the high demand ones, subscribe to personalized reports to get weekly and monthly trends for brands and products, etc. Looks solid for you e-commerce guys.